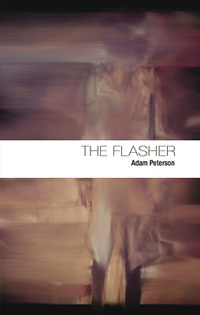 I read 80% of Adam Peterson’s The Flasher in the bathtub, which seems entirely fitting. I’m not at all afraid to say that baths stimulate me in the same way flashing stimulates flashers. Baths compel me, they invigorate me, in some strange way they solidify my relationship to the greater world. The only difference between soaking in the tub and flashing is where one is solitary, contemplative, the other asks for a wider public, a larger stage. But both are—mysteriously no doubt—borne out of reverence for one’s place in the always-spryly grinning universe. At its core The Flasher is a love story. A man—the flasher—falls in love with a woman—a muffin store employee—who “takes [muffin] batter off [her body] with her tongue” (31) and is possessing of what can only be described as a nuanced personality. The flasher attempts to woo said woman/muffin store employee. He fails. The end. Throughout the course of the book other things, of course, happen: the flasher visits his ailing mother in the hospital, the flasher makes french toast, the flasher uses a public restroom, the flasher swallows the Earth and diagnoses the sky. But the flasher’s relationship with his would be lover is the driving storyline, the one element of the book that—albeit obliquely—ties everything together. Without it there would be no, as it were, narrative thrust, nothing to continue to propel the reader forward.